For the second time in as many weeks, members of Norway’s royal family have been confronted while abroad with what’s seen as the hypocrisy of Norwegian climate and environmental policy. 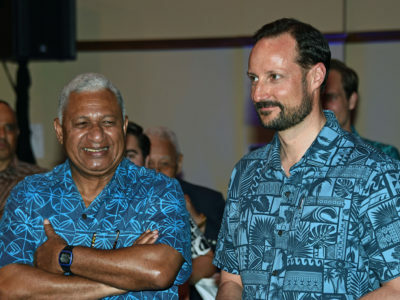 Crown Prince Haakon was the latest to receive a plea for help, this time in a South Pacific island nation that’s threatened by the carbon emissions of the oil industry. The crown prince was on an official visit this past week to the island nations of Fiji, Tonga and Samoa. He was accompanied by the Norwegian government’s minister in charge of development and foreign aid, Dag-Inge Ulstein instead of Norway’s climate and environmental minister, even though the Royal Palace states on its own website that the climate and caring for the oceans topped the agenda for meetings with local officials. 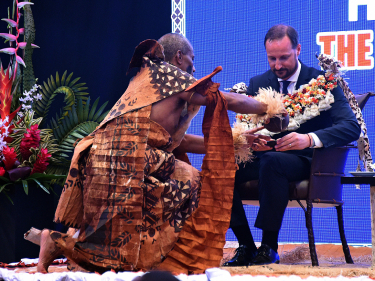 During his visit to Fiji, the Norwegian delegation’s second stop on the trip, the vice president of Fiji’s National Federal Party (NFP) Seini Nabou issued an “open letter to Crown Prince Haakon Magnus of Norway.” It was published the next day on the local website Islands Business (external link) and now has been picked up by media in Norway, including state broadcaster NRK and newspapers Dagens Næringsliv (DN) and Dagbladet. In the letter, Nabou offered “humble greetings of welcome” but made “one modest request:” She and her colleagues want Norway to stop exploring for more oil in the Arctic, and cut back on oil production. Nabou, who also is an “ambassador at large” for Fiji’s foreign ministry, wrote in her letter that “unfettered carbon emissions from one part of the globe present trans-boundary challenges and climate insecurity in another.” While applauding Norway as being one of the first industrialized nations to ratify the Paris Agreement to halt climate change, “we also know that (Norway) is actively involved in further opening up its part of the Arctic for oil and gas exploration.” She claimed that “would essentially undermine” the Paris Agreement’s goal of cutting carbon emissions. Norwegian media wrote that the crown prince was “surprised” by the letter, just as his parents King Harald and Queen Sonja were when confronted with demonstrators on last week’s state visit to Chile. Those demonstrators were protesting how Norway’s huge salmon farming industry, which has expanded to Chile, is threatening natural fishing grounds and polluting local waters. 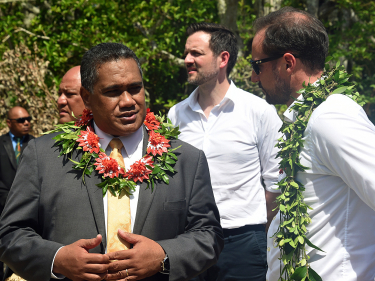 NRK reported on Friday how Norway’s official visit to the South Pacific was part of Norway’s efforts to win a seat on the UN Security Council from 2021. Fiji, Tonga and Samoa are all members of the UN and are eligible to vote on the issue. Norway has pledged to do so, but Norway has no intention of halting exploration or shutting down oil fields, much to the aggravation of climate and environment advocates also at home in Norway. Knutsen defended Norway’s oil industry by repeating its long-held argument that Norway’s offshore oil and gas production generates lower carbon emissions that those in other countries, and that the world will continue to need oil and gas for decades to come. “There is no foundation for the claim that a political decision to limit production of oil on the Norwegian Continental Shelf will contribute towards lower global emissions,” Knutsen told NRK. Norway’s largest political parties have all supported the oil industry for years because of the jobs it creates and the huge revenues it generates for the state treasury and its pension fund. The current conservative Norwegian government’s unyielding position on maintaining and even expanding oil production continues to irritate environmental and climate organizations, however, and increasing numbers of Norwegian voters. Climate issues are expected to be among the most important in upcoming elections.